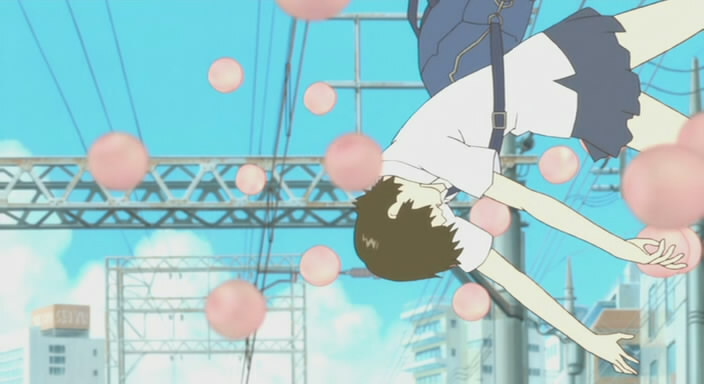 Today’s moment is not, properly speaking, a moment in the story of The Girl Who Leapt Through Time (Toki wo Kakeru Shoujo). It’s the ending song, “Garnet” by Hanaka Oku, which is not only sweet, melodic, and mood-appropriate–its lyrics fit the story well without being blindingly obvious or obnoxious. (One of my greatest disappointments was learning the English translation of the wonderful Russian choral song of Fullmetal Alchemist, “Bratya.” It was so…wooden and unworkable outside of FMA.) “Garnet” is probably the one anime song I listened to more this year than any other, for what I consider the finest anime film of the year. This feature film, directed by a Studio Ghibli castoff and with character designs by Gainax co-founder Yoshiyuki Sadamoto, is anime’s version of Eternal Sunshine of the Spotless Mind–a thoughtful, touching parable with some light sci-fi elements. A few plot twists were a bit difficult to swallow, but the vivid and accurate characterization, nostalgic mood, and lovely soundtrack more than make up for it. It’s well worth your 100 minutes.